Below are some of our projects to support the entrepreneurial endeavors of the growing, global community of mobile phone software developers. Mobile phone users in rural areas are only able to buy airtime when they go to the market in town centers - an event that occurs rarely due to the long distances required to travel. In Kenya there are millions of these rural subscribers who currently have to guess how much airtime they will use before their next visit to the local market. However, as many Kenyans can attest, budgeted airtime often disappears much faster than anticipated. Airtime Banking is an SMS application developed by Dickson Ukanga in s60 python for Kenyan airtime dealers in rural town centers to help solve this problem. 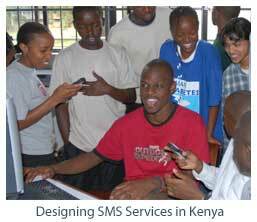 Using Kenya's standard airtime transfer techniques (Sambaza and Me2U) the application transforms a s60 phone into an automated SMS gateway. When airtime is purchased, the airtime dealer updates the client's account on the system with the purchased value and the period that the client wants the amount to last. The Airtime Banking application sends a trickle of airtime to the client's phone over the course of the selected time period, helping the client use the airtime more efficiently. While this may cut some calls short, the system guarantees the client will have access to airtime until his next trip to the market. 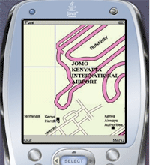 Jessica Colaco had been exploring the possibility of studying mobile GIS systems for her thesis work, but was getting increasingly frustrated that maps of developing countries such as hers were not commonly found in existing mobile map databases. After finding no suitable service that would meet her needs, Jessica developed her own system that allows a mobile phone user to view detailed street maps of Nairobi as well as access to her user generated point-of-interest (POI) database. Using a GPRS connection to our Apache web server, a user can query local Kenyan destinations, streets, businesses, or civil services such as police stations and hospitals. The locations and contact information of the results that meet the search criteria appear integrated on the map. Billy Odero, a newly graduated Computer Science student from the University of Nairobi, was moving out of the dorms and wanted to sell some of his things to the other students at the university. He was also interested in finding an apartment to share with other newly graduated students somewhere downtown. Tired of sifting through irrelevant ads on bulletin boards, Billy developed a SMS bulletin board system to help connect buyers and sellers in Nairobi. Sellers text into the MoSoko SMS gateway with information regarding the type of item (bicycle, TV, couch, ... ), their location (Nairobi, UoN Chiromo Campus), and the asking price for the item. This information is stored in a database and can be easily queried via SMS by potential buyers. During a summer internship John Muli Senga became familiar with data collection in the field, and the importance of data integrity and accuracy. However, ensuring the data's integrity becomes a difficult task without automated integrity checks - an impossibility with the standard paper-based field data collection. John set out to design a mobile phone application that enables entry data with realtime integrity checks, shifting the bulk of integrity control from the backend entry staff/system to the data collector. Collected data from his application can be uploaded remotely to a server, which does a much lighter processing and error control. The Data Logger also enables real-time data synchronization with a database server through GPRS. But to allow batch transfers and cut down the connection latency, a resident database is available which can be synchronized with the remote database at longer intervals. 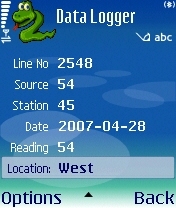 To ensure the data collectors are in the correct location, John also developed the functionality to log GSM and also GPS location information at the occurrence of an event. We will be hosting a project-based course that will allow students to learn enough of the basics of mobile phone programming to design and launch their own mobile phone application. While a major focus of the course will be on the technical skills required to build these application, we will also have a particular emphasis on opportunity analysis and product marketing. Success in this class depends on recognizing an existing market demand and the meeting that demand with the design and launch of an original mobile phone-related service. While there will be an emphasis on SMS server-side application development, we will also give students to the skills to build applications on the phone itself.